From London to Rome, travel to Western Europe’s most famous cities on this affordable European tour. Along the way, visit celebrated cities as well as picturesque towns and witness beautiful scenery. After visiting the British capital, you’ll experience an engineering marvel, the Cross-Channel Tunnel, as you take the Eurostar train from London to Paris.In Paris, Florence, and Rome, enjoy a sightseeing tour with a Local Guide, a knowledgeable expert who intimately knows the cities. See the must-see sights, including the Eiffel Tower, Arc de Triomphe, and Champs Elysées in Paris; the renaissance historic center in Florence; and Rome’s elegant streets and St. Peter’s Square, the most important architectural and religious landmark in the world. In Venice, enjoy a boat ride to St. Mark’s Square, one of the most famous squares in the world. In pretty Lucerne, see the Lion Monument, a stone sculpture erected to honor the Swiss Guards killed during the French Revolution, and the wooden Chapel Bridge, Europe’s oldest covered bridge dating back to 1333.Marvel at Pisa’s famous Leaning Tower, the Cathedral and the Baptistery on the Piazza dei Miracoli. But that’s not all…on this Europe tour you’ll also witness amazing scenery. Enjoy views of Burgundy, France’s most famous wine-growing area, prosperous farms, and half-timbered villages as you travel between Paris and picture-perfect Lucerne, as well as views of the rolling hills in Tuscany.If you desire to see some of Europe’s most picturesque scenery and famous cities, this value-minded Europe tour is the perfect vacation! Day 5: PARIS–LUCERNE AREA, SWITZERLAND. 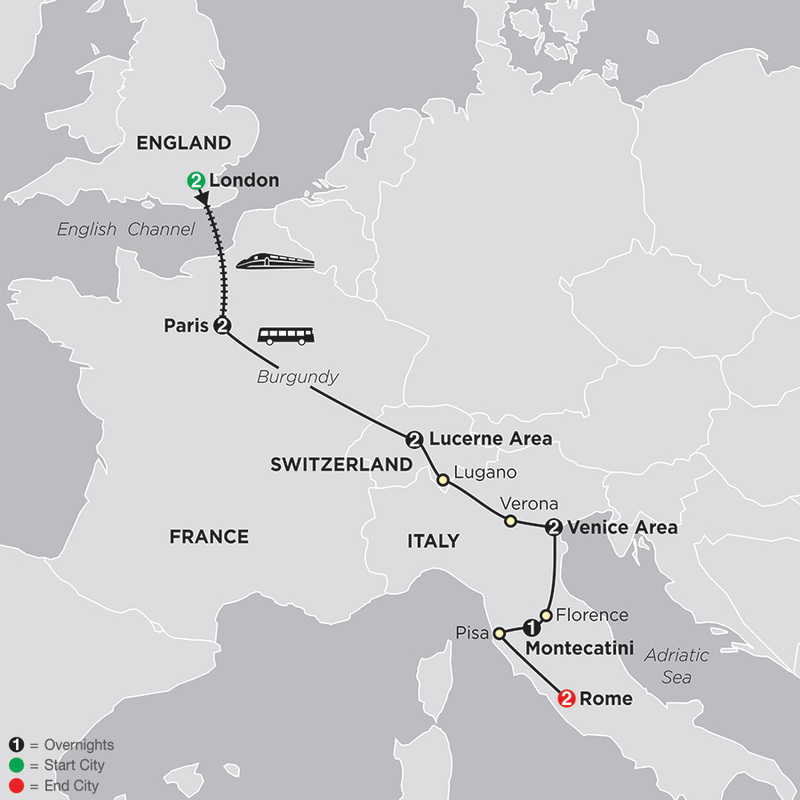 Day 7: LUCERNE AREA–VERONA, ITALY–VENICE AREA.